Mangaldai Police of Darrang district in a prompt operation on Thursday evening managed to arrest two youths on charges of being allegedly involved in a human trafficking racket. It has been suspected that the two are members of a human trafficking racket which allegedly targets young girls who are in need of money and lure them with fake promises of offering sound financial help. 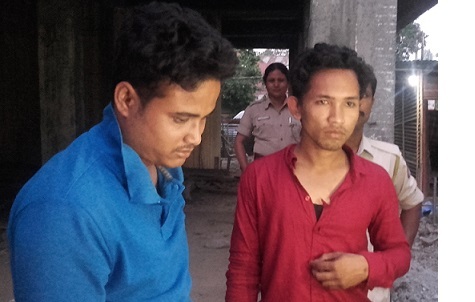 The duo has been identified as Manab Talukdar, son of Mohan Talukdar of Ganesh Mandir area of Nalbari town and Jayanta Patgiri, son of Utsav Patgiri of Khatabari village near Nalbari town of Nalabari district. According to police, one young girl of Mangaldai town area lodged an FIR at Mangaldai Police Station on Wednesday evening stating that one youth over the telephone assured her of offering an amount of Rs 70,000 to meet the medical expenditure of her critically ill mother and for that, would have to accompany him to Nalbari. The youths, who are married, also reportedly posted obscene messages on her mobile. Smelling foul play, the girl, who lost her father few years back, narrated her story to Mangaldai Police and lodged a complaint. Subsequently, a team of Mangaldai Police led by Officer-in-Charge Niranjan Barua on Thursday evening laid a trap with the help of the complainant girl and apprehended both the youths red-handed at Aulachowka near Mangaldai while they were travelling in a share taxi along with the girl. Meanwhile, the police have registered a case (No 369/18 under Section 419/363/376/511 of the Indian Penal Code) and continue interrogation in this regard. Significantly, both the arrested youths have reportedly had taken the name of an influential self-styled ‘Godman’ of Lower Assam in this incident indicating involvement of so-called religious leaders in immoral activities.